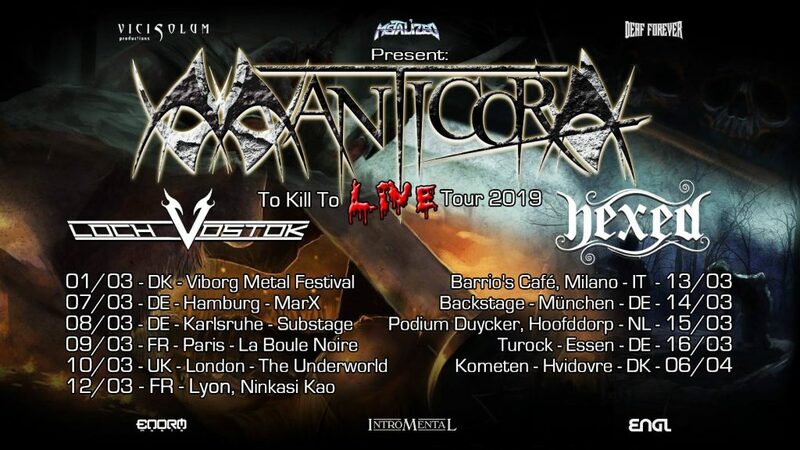 After receiving fantastic feedback for their new album “To Kill To Live To Kill”, and having torn up the North American continent live, as support for Persefone in August and September, the Danish Thrash/Power veterans MANTICORA announce their upcoming 4th European headliner tour. And the opening act will be the debut’ing semi-progressive and very melodic metal act HEXED. MANTICORA have released 8 critically acclaimed albums (and a 334 page novel), since 1999, and toured numerous times around Europe as well as in North America + played at prestigious festivals, such as Wacken Open Air, Sweden Rock Festival, ProgPower USA, etc. This entry was posted in Band News on October 16, 2018 by admin.